Summary: Candice is just trying to get through a terrible summer; she and her mother have temporarily moved to her late grandmother’s house in Lambert, South Carolina, while their home is being renovated so her newly-separated parents can sell it. 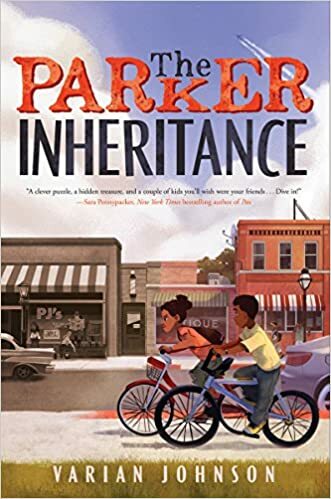 When she and her neighbor Brandon discover a letter in her grandmother’s attic, they are launched on a treasure hunt that takes them back to Lambert’s segregated past. Scenes from the 1950’s through the 1980’s are interwoven with Candice’s and Brandon’s story so that the reader gradually learns about the mysterious James Parker who supposedly has left a fortune somewhere in Lambert. When the two kids solve the final clue, the past meets the present and some of the wrongs from that past begin to be righted. 352 pages; grades 3-7. Pros: An amazing book that touches on racism, bullying, and homophobia without ever losing its light touch. It also celebrates reading and puzzles, paying particular homage to The Westing Game. Reading it, I was reminded of Holes in the way the narrative moved between the past and the present, and everything came together in the end. Since both of those books won a Newbery Medal, why not this one as well? Cons: The solution to a key puzzle seemed impossibly esoteric.